Six students from the Student Business Leadership Academy (SBLA) made the 12-hour drive to help Coastal Empire Habitat For Humanity for the second consecutive year. They gained muscle mass and so much more during the service-learning experience. “This year’s trip was special because we helped build a house for a woman and her son. She was a veteran who served in Iraq, and it meant a lot to give back to someone who sacrificed everything so we can live in this wonderful country,” said Alyssa Goen ‘20 (sports marketing), who planned and participated in the 2017 and 2018 trips. Activities included nailing sheaths to the frame of the house, adding trusses to the roof and working in the ReStore, where they unloaded truckloads of donated furniture and household items and prepared them for resale. “This trip was such a humbling experience. It was so rewarding to see how our hard work moved the house further along in the construction process. 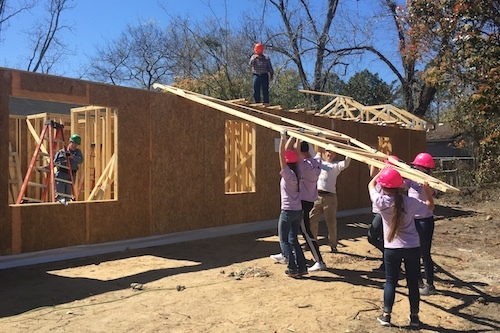 Meeting the homeowner really opened our eyes to how just a week’s worth of work made such an impact in her life,” said Olivia Vormohr ‘19 (finance), who was an integral part of making the trip a reality. 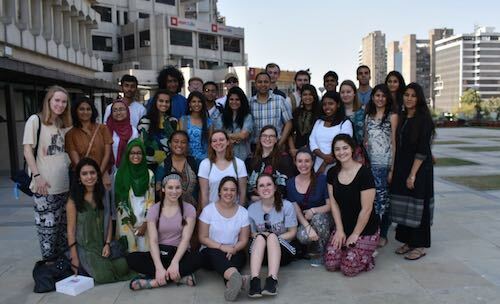 Students from the Politics in South Asia class visited India for a closer look at Indian economy and society. Led by Milind Thakar, associate professor of international relations, and Paul Levesque, assistant professor of German, a dozen students traveled to the capital city of Delhi, the southern state of Kerala and other cities and towns to experience the contrasts between India’s wealth and poverty, as well as the country’s ethnic, religious and linguistic diversity. Melissa Kapsalis ’18 (political science and psychology with pre-law concentration) said she was impressed with how the trip managed to encompass so many aspects of Indian culture and life in a short time span. “India is a little bit of everything. It has wealth, poverty, religion, beauty, destruction, and it could change each time you cross the street,” Kapsalis said. A group of 19 students, faculty, staff and alumni involved in the MBA program visited Hong Kong and Vietnam to explore business relations in those countries. Many of the students who participated in the trip were members of the MBA 652 Global Business Seminar class taught by Kathy Bohley, Professor of International Business & Marketing. Students had a business meeting in Hong Kong with Fidelity Investments, then traveled to Ho Chi Minh in Vietnam for a cultural tour, including a day trip to the Cu Chi tunnels, the Reunification Palace, the War Remnants Museum and the Mekong Delta, where they learned about the rice paper industry and other manufacturing in Vietnam. They also met with Intel Products leadership and toured Intel’s manufacturing facility, and met with the U.S. Commercial Services to discuss American business in Vietnam with a commercial officer. 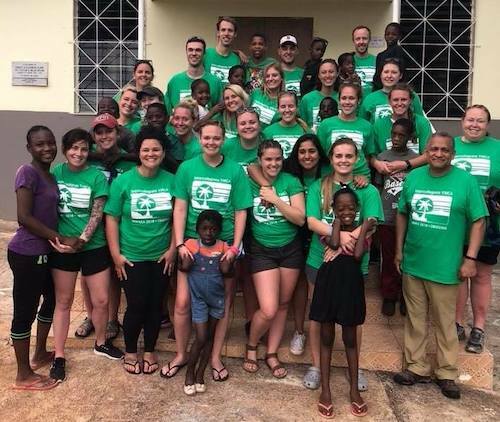 A small group of students teamed up with Intercollegiate YMCA and four other schools for a service trip to Mandeville, Jamaica where they volunteered at the Hanbury Home for Children. It was the first time Isabel Tintera ‘20 (criminal justice) had been out of the country, but that didn’t interfere with her excitement. “Kids have always had a soft spot in my heart, so I was eager to hang out with them and hopefully impact their lives in a positive way. The experience was remarkable,” she said. 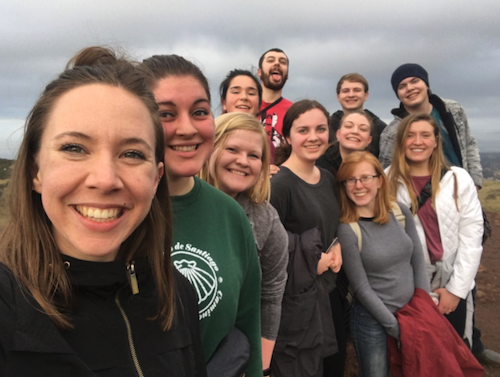 Danielle Hendricks ‘18 (social work) hadn’t been involved in a service trip before, but said she was excited for the chance to get outside her comfort zone. “I hope I impacted the children in the orphanage and made their day brighter than usual,” she said. Students from the Scottish Literature class spent the week across the pond, visiting sites related to this semester’s readings, including the home of Sir Walter Scott (after having read his novel Waverley) and the Isles of Mull and Iona, which are referenced in Robert Louis Stevenson’s novel Kidnapped. Talk about a hands-on approach to learning! Interested in service-learning opportunities? Learn more. Interested in study abroad opportunities? Learn more.